I have been using essential oils for a few years now. I have mainly been using the most common ones(lemon, peppermint, lavender, eucalyptus, grapefruit, etc.) This past year as my grandma has gotten into the oils she has actually taught me more about them because she studies everything about them all the time. So that being said, I really enjoyed this book. I was actually really surprised at how much info was in this book. Not only is it perfect for newbies but also for those that need something to look back at and reference. The best part of this book is the multitude of recipes and remedies that fill up a good portion of this book. From everything you can imagine, there is a recipe to make it with essential oils. Need hand soap? Shampoo? Deodorizer? Roll on blends? The author does not promote a certain brand of essential oils BUT he does state what to look for in high quality oils and to not be fooled by the cheap stuff. 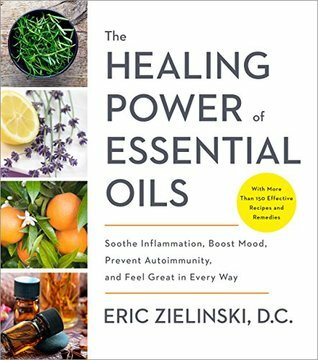 This book gives a wonderful overview on most questions with essential oils and especially if you are a newbie to oils, this is a great book. "I received this book from Blogging for Books in exchange for an honest review." Blogging For Books is closing and this last month was the last time they were letting people review books. I am sad about this, they were the first company I started to review for and who got me into blogging in the first place. While there are so many other publishers and companies out there still doing these things, it seems that change is on the horizon when it comes to blogging in general. I am thankful for all of the books I received from Blogging for Books (167 total!) and for the inspiration to start reviewing books in the first place.